You may remember the book 'Tell Me Where it Hurts' by Nick Trout. Even though it was published back in 2009, we remember reading it a few years ago. We got it from the local library and really enjoyed it. Now Nick Trout has released another book that we highly recommend. "The Patron Saint of Lost Dogs' is a really quick, fun and entertaining read. And no it won't make you cry (since I've been asked that a lot lately :). 'The Patron Saint of Lost Dogs' will make you giggle on occasion, wonder what's around the corner, and in the end say...awwwwww. It's a feel good book, through and through." It's the story of Dr. Cyrus Mills, son of a long time, small town, well respected vet in a fictional town in Vermont. After inheriting the veterinary practice following the death of his father, Cyrus takes over the practice with one goal in mind...to get the heck out of dodge. But the lives of dogs, cats and those in need takes over, Cyrus' endearing, caring and concerned nature takes over, and he learns that life in a small town has it's advantages with both two and four leggers; and maybe, just maybe you're really home at last. We think you'll enjoy the book! It's a recommend for your summer reading list. Get the 'The Patron Saint of Lost Dogs' on Amazon, or get the Kindle version! 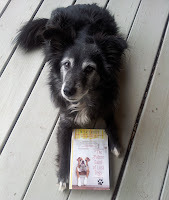 And, thanks to the nice folks at Hyperion (click to read an excerpt) for sending us a free copy of 'The Patron Saint of Lost Dogs' for reading and reviewing! This sounds like a wonderful book! We'll be checking it out! Thank you for the review, Johann! That sounds like a really good read. Thanks for reviewing. I does hope Gracie's nail doing ok!